Little ones learn about bugs. The world of insects and like small creatures is the focus of this sturdy board book. Each turn of the page gives readers a close view of a particular habitat. 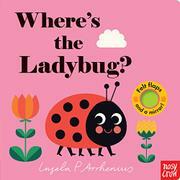 The text asks, “Where’s the ladybug?” or “Where’s the snail?” and little ones are encouraged to find the creatures under shaped felt flaps. A caterpillar poses under a leaf with a few bites taken out of it; a bumblebee flies behind a pink tulip. The flaps are made of a reasonably strong material, secured tightly within the book’s pages. Extremely determined readers may figure out a way to pull the flaps out, but most will enjoy flipping them up and over with ease. The last page of the book contains a mirror hidden behind a bush-shaped flap, and readers are asked “And where are you?” The insects smile with big eyes and are composed of large, circular, clean-edged shapes. The color palette is dulled, making the neon flaps pop effectively for little readers. Concurrently publishing companion Where’s the Giraffe? explores the world of jungle animals.